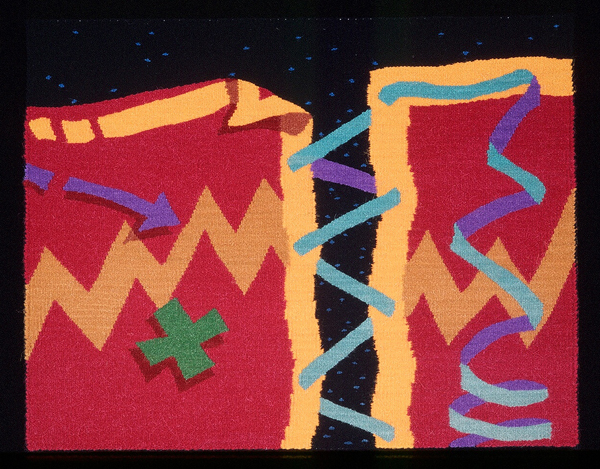 As noted in an email to me by Mary Lane, Director of the American Tapestry Alliance, ATA co-organized a landmark international exhibition, World Tapestry Today in Melbourne, Australia in 1988. I vividly remember the event and symposium held in conjunction with the Australian Victorian Tapestry Workshop (ATW), not least because I became life long friends with Marcel Marois from Canada and Kay Lawrence from Australia. Both internationally renowned, Marcel was one of the first jurors and Kay remains on the board of trustees for the ATW. 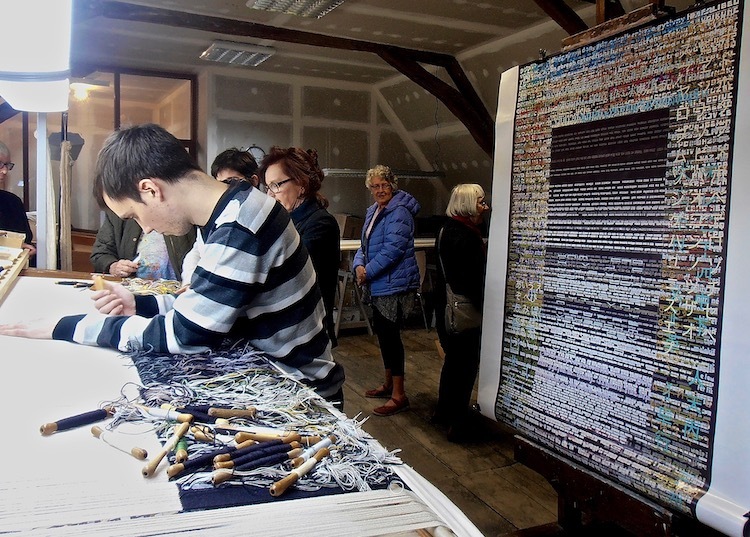 For many Europeans, like Marika Szaraz of Belgium, tapestry remains a traditional art form. She has been very active, not only being the one artist who successfully exhibited her work in 1988 and again in 2018, but also as an advocate in the field. Szaraz was the curator for the 3rd Asia-Europe Fiber Art exhibition that travelled to Central Museum of Textiles, Lødz, Poland in November 2017. Interesting the differences between the work of artists employing textile forms in Asia from traditional tapestry weaving in other parts of the world. Nonetheless, to encourage cross cultural dialogue such exhibitions are ideal opportunities for artists and curators to network and exchange ideas and practices. 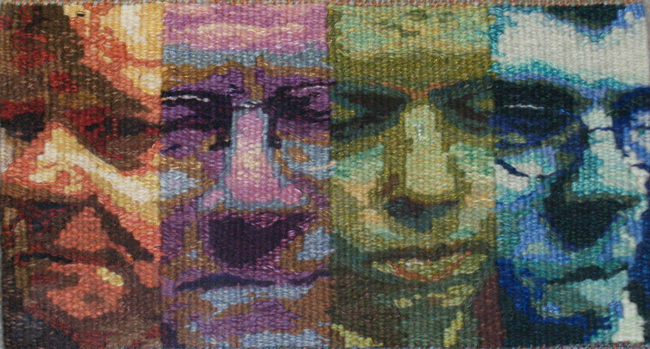 It is quite a challenge for ATA to organise World Tapestry Now: American Tapestry Biennial 12 as an online showcase. Whilst exhibitions can be expensive to organise, transport and display, there is something about the texture and surface of a tapestry “in the flesh,” so to speak, that gives it a compelling presence. 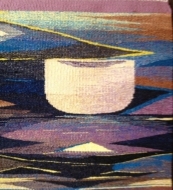 It must have been quite a task for the 2018 juror for World Tapestry Now, Professor Włodzimierz Cygan, to select 43 tapestries from a total of 302 entries, knowing that the experience of viewing the work in digital format is very different from what he experienced seeing the Lødz Treinnials, or the 3rd Asia-Europe Fiber Art exhibition last year. Whilst some of the artists selected, and their work, are well known to me, for example, Barbara Heller and Jane Kidd from Canada, Felisksas Jakubauskas from Lithuania, Anne Stabell from Norway, Fiona Hutchinson from UK and Judit Pazmany from Hungary, there are some new contemporary voices. From the USA, Erika Diamond’s Three Fates Floating very successfully reinterprets The Three Fates tapestry from the 16th century through the graphic depiction of flotation devices as survival aids. Despite the rise of the internet, visiting physical museums and galleries remains popular. Yet visiting museums and galleries in person takes time and money, particularly as it often involves travelling great distances. There are numerous online projects aimed at making cultural institutions more accessible by digitising art collections, and uploading videos, photos, and other documents of culture and history. But is an online visit as good as an in-person trip to a gallery to view an exhibition? Does viewing art online diminish or increase the overall experience? At the Royal Museum of Fine Arts in Brussels, a partnership was formed between their Bruegel exhibition and the Google Cultural Institute. Art is mixed with virtual reality and technology to bring Bruegel to a global audience who might not otherwise have the opportunity to see the works up close. Whilst Google’s presentation using super high-resolution Gigapixel imagery is impressive, you don’t see any surface, even in the details. You can’t tell if something is gloss or matte or if there are any bumps. This is an especially important factor in tapestry, where surface, shape, movement and textural combinations of silk, weave, paper and sisal illuminate. In addition, colours look different, because colour is electromagnetic waves. We see everything in gray if there is not enough light. So the debate continues in terms of museum and gallery attendance. In other areas of digital production, over the last five years, the American artist Kiki Smith has designed a collection of eleven, ten-foot high, electronically woven tapestries for a solo exhibition, Woven Tales (2016). 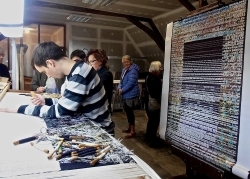 Like the British artist Grayson Perry, Smith’s handwork, collaging and designs are translated into a digital weave file and sent to an electronic, double-headed Jacquard loom for proofing as a textile. 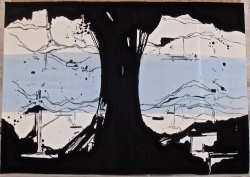 The China Academy of Art in Hangzhou, which takes a leadership role on questions of national cultural policy, purchased Perry’s 2009 The Walthamstow Tapestry for under US$150,000.00, post Fiber Visions, the first fiber triennial in 2013. This seems inexpensive now. In 2016, at Christie’s, a number of tapestries created after designs by Alexander Calder achieved a high selling price, significantly more than their estimates. These included one of his six American Revolution Bicentennial tapestries from 1975, created by the Aubusson-based Pinton Frères workshop, which sold for $8,250 (despite being in an edition of 150). It has always been the case that the most sought-after tapestries are those by big-name artists, but to me these can often be described as woven paintings. The Vojtech Blau gallery in New York has an abstract Sonia Delaunay tapestry, c 1970, for sale for $65,000. A painting by Delaunay would cost almost ten times as much. Individual tapestry artist/ weavers find it much more challenging to achieve this kind of economic viability. 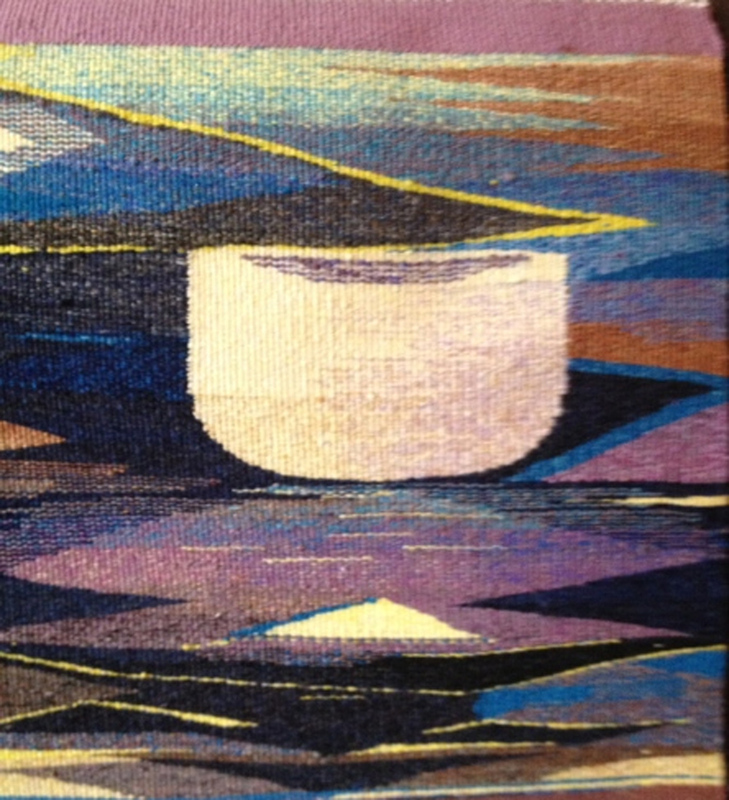 I met two highly regarded tapestry artists from the 1980s and 1990s when I visited the Hannah Ryggen exhibition, Woven Histories at the Museum of Modern Art in Oxford, UK in February 2018. Both Tass Mavrogordato (UK) and Dilys Stinson (USA) have stopped weaving as it was just not financially sustainable for them. They now work fulltime as the chief executive of Immitown for New London Architecture and a psychotherapeutic counsellor, respectively. You can sense some of Brennan’s interest in surface in World Tapestry Now, but not the likes of Hannah Ryggen’s imagery, who was not from Iceland as Brennan thought (she was one of his ‘heroes’ in his 1988 essay), but an émigré from Norway. Ryggen’s recent exhibition in Oxford was worth travelling the globe to see first-hand. Her impassioned responses to the socio-political events of her time, produced in isolation as a farmer’s spouse, witnessed the rise of fascism, the Nazi occupation of Norway and media coverage of the Vietnam War. They bear witness to the narrative power of tapestry in its richest form. 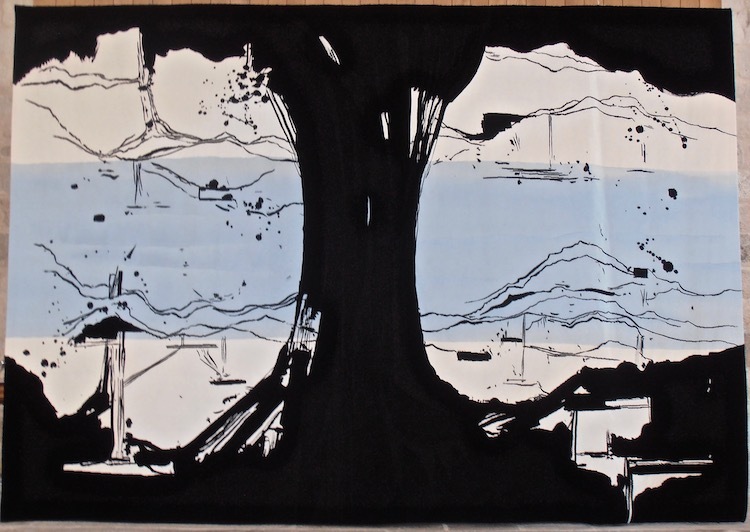 Janis Jefferies is an artist, writer and curator, Professor of Visual Arts and Research, Research Fellow at the Constance Howard Resource and Research Centre in Textiles, Goldsmiths, University of London.